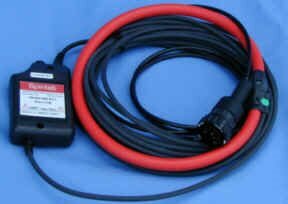 Never again will you have a problem getting around a bundle of cables or a bus bar with a typical split core current transformer. The solution is here with the Spinlab non-ferrous flexible core AC current probe. This unit allows you to easily and safely take current measurements for ratio tests. Plug it into the Bird Dog Plus and take your measurements like any other probe. The unit does not have a metal core and is electrically isolated to protect you. 600-MB1/2/3 Plug-in Meter Base Adpt.